Okay, soil nerds. I've seen this factoid everywhere, haven't you? 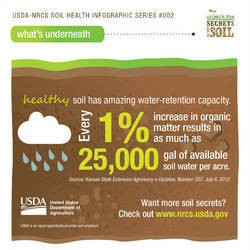 "Each 1 percent increase in soil organic matter helps soil hold 20,000 gallons more water per acre." But NRDC's soil team wanted to learn more about how this works, and under what circumstances it is true. And that's what we're going to dig into now (see what I did there?). I was actually a soil science major in college, so I thought it would be easy to figure out the math behind this statement, but my own attempts came up short. Fortunately, a true expert in soil organic matter was willing to help me out. Dr. Michelle Wander, Professor of Natural Resources and Environmental Sciences at the University of Illinois, graciously showed me the math behind this equation. More importantly, she impressed upon me that, while this is a perfectly good simple equation, the real story behind soil organic matter and water is more...layered. Perhaps the only generality we can make is that healthy soil is priceless. Climate change is already affecting weather patterns in the Midwest, making farming even riskier. It's even more important to protect our soil as drought and flood expose it to erosion and degradation. The weather pattern in the Midwest has shifted. Hard, fast rains will be followed by long periods of drought, and soil under conventional production agriculture can't keep up with the changing climate. "We need to find a way to slow the water down, trap it at the surface and give it time to infiltrate," says Dr. Wander. Let's look at the calculation behind our often-quoted fact. There are 616.7 cubic meters of soil in an acre (area x depth = 43,560 ft/acre x 0.5 feet deep = 21780 cubic feet/acre = 616.74 cubic meters of soil/acre). Next, we convert volume to mass: multiplying 616.74 by a bulk density of 1330 kg/cubic meter (or 1.33 g/cm3) to get 820,264 kg (x 2.204623 lbs/kg = 1,808,322 lbs) of soil per acre. We used an assumption for bulk density in this calculation; I will explain what that means later. We want to know how much an increase of 1% organic matter would increase the water holding capacity of the soil. If an acre of soil is 820,264 kg, then 1% organic matter would be 8,202.6 kg/acre. Now let's make some more assumptions. First, we will ignore the amount of water held in the soil itself, and only calculate the water held in the additional organic matter. How much water does a kilogram of organic matter hold? If we make the assumption that organic matter holds 10 times its weight, or 82,026 kg (180,836 lbs) of water. There are 8.3454 lbs in a gallon, so that is 21,668 gallons of water. The math in our commonly quoted fact checks out. As you can see, we used a lot of assumptions to make the math come out right. Let's talk about those assumptions, starting with bulk density. Bulk density is a measure of soil compaction; it's the weight of the soil divided by its volume. Lower bulk density is better; a surface soil with higher than 1.4 bulk density is in bad shape. Bulk density varies a lot in real soils, depending on the soil's texture, which can be fine (clay), medium (silt), or coarse (sandy), but also the structure of the soil. A soil with good structure will have plenty of pore space, and a good mixture of continuous large and small pores. In this equation, we used the bulk density of a medium-textured soil with 50% pore space - 1.33 grams per cubic centimeter. When soil is tilled, it temporarily has a lot of pore space in the top layer. But tilling involves running over the soil with heavy equipment, and that leads to structural breakdown of the soil and compaction, or layers with high bulk density and bad pores, topped by loose soil with no structure. When the soil has poor structure, it can't hold water within the pore spaces, and then the water hits the compacted layers and can't infiltrate. This leads to more runoff, and therefore, more erosion, flooding, more pollution, and less water held in the soil for the dry times. However, a healthy soil with even small increases in organic matter can actually improve soil structure. Soils with a lower bulk density and greater porosity route water more efficiently during floods and retain more for plants, and so perform better during droughts. We also assumed that organic matter holds 10 times its weight, when it may hold more or less by an order of magnitude. Organic matter particles have a charged surface that attracts water so that it adheres to the surface, like static cling, but may also have pores and charges that repel water. A 1994 study by Hudson showed that a silt loam soil with 4% organic matter holds more than twice the water of a silt loam with 1% organic matter. Finally, we are only looking at the top 6 inches of soil. Dr. Wander told me that "soils are three-dimensional bodies; this is the key to the way they act and function. To understand them you need to know the hydrology; deeper subsurface properties are very influential." So what is the best way to protect our soils and make them more water-efficient? We can increase the level of organic matter, for starters. Reduced tillage or no-till, keeping plants in the soil year-round, integrating livestock into crop rotations - these are a few tried and true methods that farmers like NRDC's Growing Green Award Winner Gabe Brown have put into place. Brown increased organic matter on his farm from less than 2% to greater than 5% after making some changes on his North Dakota farm. NRDC supports farmers like Brown who are regenerating the soil, sequestering carbon, and improving water efficiency in agriculture. We're working on building a pilot program that would create incentives for building healthy soil by offering a discount on crop insurance to farmers growing cover crops. Stay tuned, and in the meantime, show your love for soil in the comments. 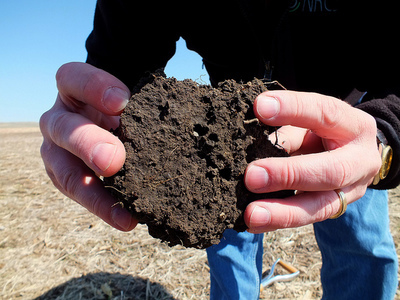 What do you think we need to be doing to improve soil health?